Later on that evening, after a busy day of unpacking, Maggie and Evan watched a couple of TV shows together before heading to bed. At one point they paused to make a snack and when they returned to the room, the screensaver was on. But it wasn’t the mountains anymore. The doll scene was back. She shrugged and put their show back on. The next morning she turned the TV on to view her favorite cooking program while preparing a grocery list, and forgot to turn it off when she went to the store. Evan had gone to work and wouldn’t be back until dinner. An overcast day, it was drizzling by the time she got home and the house seemed unusually dark for a summer afternoon. It took a few trips to unload the car but she soon had all the grocery bags piled together on the old-fashioned hardwood flooring in the sun room. Kicking off her sandals, she carried the first load inside and stopped in the hallway. Through the opening to her left, the TV screen illumed the shadowy living room like a muted lamp might do. Maggie set down the bags and approached it. Up until now she’d barely focused on the image, not caring enough to take in the specific details. This time she examined it intently, feeling a tad uneasy. She’d seen that type of doll before, come to think of it, years ago. Bangs, curly platinum hair, gray irises, dusty rose lips. What had its name been again? She couldn’t remember. Returning to the sun room, she retrieved her phone from her purse, and asked it a question. “The doll’s name was Lola,” came a slightly robotic, female vocal response. Maggie walked back to the living room and stared at the TV. Snatching up the remote from the coffee table, Maggie switched the screensaver back to the mountainscape, turned off the TV, and finished unpacking the groceries with a feverish pitch. More than once she glanced out the rain-spattered kitchen window where only the corner of the locked shed was visible in the backyard. She shuddered. No, the police would have scoured the entire property—a locked shed no deterrant. By late afternoon the rain had let up, though it remained cloudy and cool. When Evan came home at suppertime, she told him what had happened to the previous tenants, and about the screensaver resetting itself. Agreeing to help, if only to set her mind at ease, Evan finished eating and spent a half hour in the garage rummaging through unpacked boxes until he finally found the tool. She followed him out into the dank backyard, smacking or waving away each mosquito that honed in on her, and stood with arms crossed watching. The windowless shed was somewhat secluded, backdropped by leafy trees and thorny undergrowth. Weeds and uncut grass grew up the wooden sides, and the shingled roof was curling in places. “Probably empty,” Evan said with a grunt as he cut through the metal lock. The dismembered lock fell to the grass in two pieces. He straightened up and opened the creaky door, peering into the dark interior. “Nothing but a wheelbarrow,” he said. “What!” She hurried to the opening as Evan stepped aside. An overturned wheelbarrow was propped up against the wall in the right hand corner. A clump of something hung from a nail on the wall next to it and as her eyes adjusted, she realized it was a tied bouquet of dried flowers. The rest of the shed was indeed empty, including a single shelf. By now the mosquitos were swarming and pricking but she no longer noticed. Taking the wheelbarrow by the handles, she stepped back and pulled it outside. 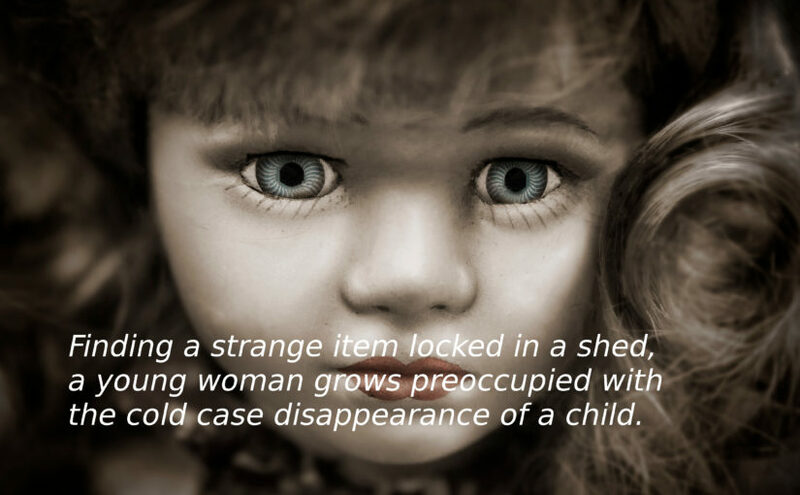 In the now revealed corner of the shed sat a Lola doll coated in cobwebs, eyes closed. Super interesting concept and commentary on our current technological-dependant society! I was hooked and totally creeped out! Did not predict ending at all. Wish I didn’t read before bed… Well done Bekah!